A food blog about Olive Garden? I am fairly certain I might get fired from contributing to savory linings after publishing this blog...probably have completely ruined savory linings chances of ever being quoted by the NYtimes Food section...but this is okay. I feel compelled to blog about a restaurant that I will admit I have looked down upon since I have moved to New York six years ago. Don't get me wrong, I think Olive Garden is great in suburbia when there are no decent Italian restaurants. I have only looked down on OG in New York. 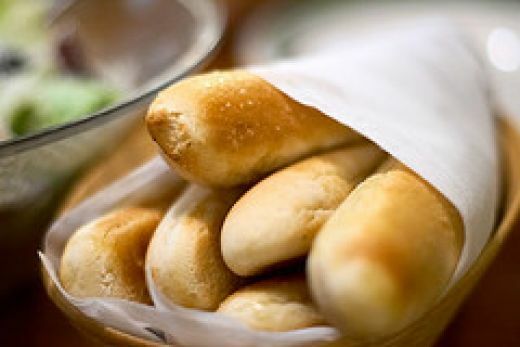 When you are living in New York where there are thousands of amazing Italian eateries with house made pasta, freshly baked bread, and local artisan meats and cheese...why on earth would you go to Olive Garden? 2. Unlimited Garden Salad and Bread-sticks -- don't forget the peppercinos...I LOVE PEPPERCINOS. 3. It's a Wednesday night/everyone else got tickets to passion pit. I am admitting right now I had an excellent time at Olive Garden. I give the credit to the great company, my $13 dollar dinner which included two bowls of unlimited garden salad, 2 bread-sticks, and a glass of wine (You really can't beat that), and the hilarious restaurant manager who criticized our ability to order a bottle of Chianti. First the salad. This is the easiest, most low key salad put together -- garlic croutons, iceberg lettuce, peppercinos, some red onion, and a few sliced tomatoes. If I made this for myself for dinner...I would starve. But for some reason this salad combined with Olive Garden's Italian dressing and a bread stick to sop up the dressing is seriously an amazing meal. "Why is this poor combination of ingredients so delicious to me?" I thought as I dipped my pepperchino's into my Italian dressing (on the side). The highlight of the night was after we received our bill and we realized our waiter had served and charged us for the higher class $35 bottle of 'Chianti Classico' when we had actually asked for the $25 bottle of just 'Chianti'. After a small debate, we thought it was fair game to tell the waiter that we had actually ordered the regular bottle and asked if our bill could be adjusted. Our waiter agreed with us immediately, acknowledged the misunderstanding was his mistake, and said he would revise our bill. Easy. Harry: "Hello Ladies, How has your evening gone. Was Dinner okay?" Us: "Yes, thank you! The dinner was great"
Harry: "That's fantastic. So I heard that there is a misunderstanding about your bill...you see, you ordered the chianti and this is what we gave you. Why is there a need for an adjustment?" Us: "Yes, we ordered the chianti but we got the chianti Classico. We didn't know this was the more expensive bottle"
Harry:"Well you should have been more specific - next time you order, you need to be more specific as to which bottle of chianti you want from us"
Us: "Well, we didn't know there was a more expensive bottle of Chianti Classico...this is why we said we just wanted the Chianti. Harry:"But this isn't our mistake. You asked for the bottle of Chianti, so we gave you this bottle of Chianti." Us: "But if the cheaper bottle of chianti is 'chianti' whereas the more expensive bottle is chianti Classico...how could we have been more specific?" Harry:"You should have said you wanted the cheaper bottle. I will let this go this time but next time, you really need to be more specific about which bottle of chianti you want." Needless to say...weekday night at Olive Garden isn't so bad. I got a cheap dinner and an after-dinner show! Probably will not go back due to our chianti misunderstanding but I am pretty happy I was able to enjoy my unlimited garden salad with bread sticks and be reminded of how much I enjoyed them once.